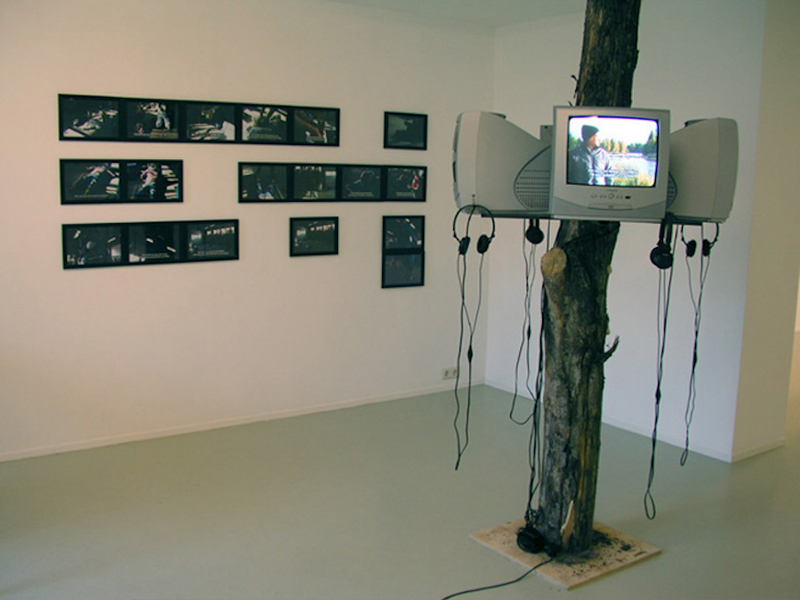 Installation view from Motive Gallery, also showing the related series of eighteen printed video stills, The Roof-team’s Doll. Stills from 4-channel video installation. In the early 1990’s me and three friends found a dead body while on a fishing trip. Filmed roughly ten years later, Esprit de Corps revisits this incident from four highly personal perspectives. This work not only shows the influence that trauma, and time, will exert on something so inherently flawed as our memory, it also shows how people have a tendency to put themselves smack in the centre of a story like this. Four mini-documentaries play simultaneously on separate monitors, thus allowing the audience to circle the subject in order to shape their own view of what actually took place on that fateful day in the spring of 1993. Or was is during the fall of 1995?